Things from Jimmy Choo have been a bit “blah” lately. They’ve continued to make a lot of popular styles from previous seasons in new materials and finishes, which should make the brand’s devotees happy, but I always prefer to see something new alongside old favorites. The Jimmy Choo Rosa Satchel maybe not seem all that striking or innovative to the casual observer, but for Choo, it’s something a bit different. Many of the brand’s bags have been a bit over-designed in recent seasons, and with that in mind, the restraint and editing that went into this design are admirable, not to mention very attractive. Many brands have been looking to pare down their offerings into sleeker, more subdued shapes that will appeal to today’s recession-addled consumers, and this is the right way to do it. This bag doesn’t lack in glamour or sophistication, but its lines are a bit less aggressive than what we might have seen in 2006, for example. 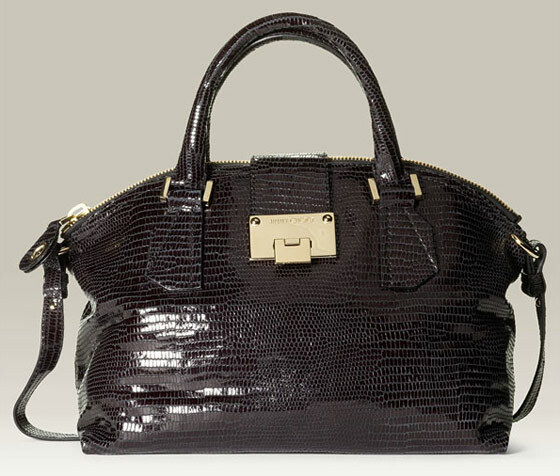 The embossed lizard gives the bag texture on top of the already shiny leather, and the way the light hits the finish of the bag creates a sophisticated shine that you just can’t get by dunking a bag in a vat of sequins or glitter. Well played, Tamara Mellon. Buy through Nordstrom for $1750.